Wish you were here er örsýning og póstkorta prójekt málarans Soffíu Sæmundsdóttur og fjöltæknilistakonunnar Heike Liss sem kynntust á námsárum sínum í Kaliforníu. Frá janúar 2015 hafa þær búið til og sent hvor annarri póstkort þar sem þær fást við landslag hvor með sínum hætti. Á meðan á sýningunni stendur munu listakonurnar sýna kortin sem hafa ferðast milli heimshluta en einnig munu þær setja upp einskonar framleiðslustöð í Grafíksalnum og halda vinnunni áfram sem á þessari stundu er óljóst hvert stefnir. Eftir það er hún opin föstudag, laugardag og sunnudag kl. 14-18. Grafíksalurinn er í Hafnarhúsinu, Tryggvagötu 17 hafnarmegin. 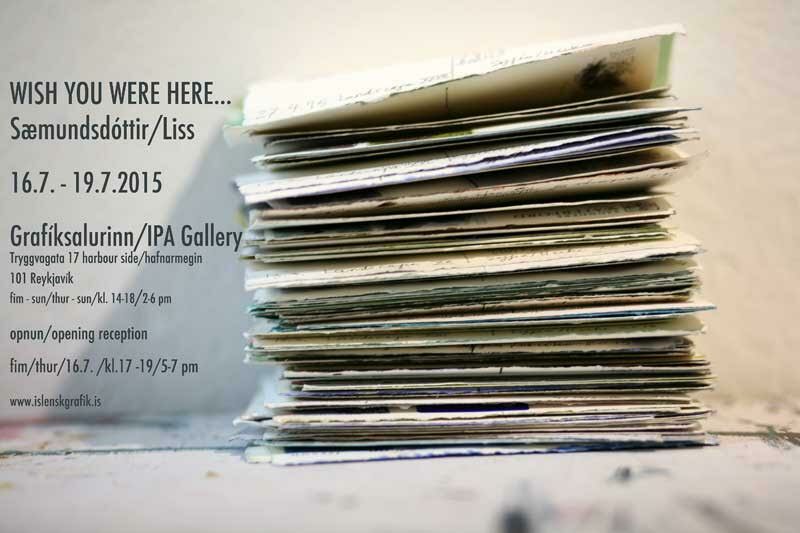 Wish you were here is a mail-art project by Icelandic painter Soffia Saemundsdottir and German multi-media artist Heike Liss. Since January 2015 Saemundsdottir and Liss, who met while studying in California, have been making and sending postcards that explore their perceptions of landscape. For the duration of the exhibition the two artists will not only show the cards that they have already produced but also set up a makeshift studio at the IPA Gallery in Reykjavik to continue to work on this open-ended venture. The exhibition opens on thursday July 16th from 5-7 pm and is open from 2-6pm. after that until sunday July 19th. The IPA Gallery is at Tryggvagata 17 in Hafnarhusið by the harbour side. Heike Liss works in a variety of media, including video, photography, drawing, sculpture, site-specific installation and public intervention. Her biggest inspiration is everyday life—the world and the people around her. She studied Ethnology and Cultural Anthropology at the University of Tübingen before attending Mills College, where she received a Master’s degree in Studio Art. Heike’s award-winning work has been exhibited internationally in museums, galleries and at film festivals. She has collaborated with choreographer François Verret, musicians Ellen Fullman, GAW, Marcus Weiss, Sylwia Zytynska, and Theresa Wong, multi-media artists Ellen Lake, Nomi Talisman, and Michael Trigilio, painter Soffia Saemundsdottir and poet Lyn Hejinian, to name a few. In 2011 she co-founded the dance theater collective this sweet nothing with composer Caroline Penwarden and choreographer Sonsherée Giles. Their first collaboration (Was It a Dream I Loved) was presented to critical acclaim in February 2012 in Oakland, California. Since 2014 Heike is performing live visuals with her long time collaborator and travelling companion Fred Frith, as well as other musical improvisers such as Ikue Mori, Lotte Anker, and Shelley Hirsch. She lives and works in Oakland and Basel and teaches at the Universidad Austral de Chile in Valdivia. Soffia Sæmundsdóttir works mainly in painting and drawing and has been active in the icelandic/international art scene for the past decade. She’s inspired by landscape and nature and seeks unknown places to explore. She’s a printmakers graduate from the Icelandic College of Arts and Craft and did her MFA in painting at Mills College California 2001-3. She has had numerous solo shows and participated in group shows in Iceland and abroad and has collaborated with fellow artists as well as with international printmaking collaborations. She has been an artist in residence around the world such as Lukas Künstlerhaus in Ahrenshoop Germany and at Leighton Studio’s at Banff, Canada. She’s a Joan Mitchell Painter’s and Sculpture Award Recipient and a price winner in Winsor and Newton International Painting Millennium Competition. She was the Chairman of Icelandic Printmakers Association 2011-2015 and is now on the association’s show committee. She lives and works in Reykjavik greater area.